Sometimes, the self-referential, apolitical worlds of art and architecture intersect with politics in unexpected ways. Two weeks ago, as the student occupations spread, and on the same day as the 'Day X 2' demonstration across central London organised by student protesters against cuts and fee rises,1 there was a story in the local and architectural press that, for me, summed up much of what students were fighting against. This was the granting of planning permission to something called 'The Quill', a tower of student housing for a London SE1 site close to Renzo Piano's 'Shard' - only this was aimed by developers at students from nearby King's College. It's a fine example of contemporary architectural idiocy, a lumpen glass extrusion full of clumsy symbolism. The flurry of steel spikes that gives it its name is 'inspired by the literary heritage of Southwark'2 - but it's a reminder that students are far from the privileged, cloistered group that some present them as. It's the obnoxiously detailed tip of an iceberg, an epitome of the years of awful student housing that has resulted from the partial privatisation of education. Developers have made large quantities of money out of some of the bleakest housing ever built in the UK, marketing it as student accommodation usually on sites which would otherwise be allotted to 'luxury flats' or other 'stunning developments'. Student-oriented property developers like Unite and the amusingly named Liberty Living are, amongst other things, revivalists of the prefabricated construction methods favoured by the more parsimonious councils in the 1960s, and their blocks, all with attendant 'aspirational' names - Sky Plaza in Leeds, Grand Central in Liverpool - recall the worst side of modernism, in their cheapness, blindness to place and total lack of architectural imagination. Inside, they're a matter of box rooms leavened by en suite bathrooms, for which the developers charge outrageous rents.3 The most apparently 'luxurious' of them - the skyscraping Nido Spitalfields in London, charges £1,250 a month for each of its self-described 'cubes'. Grand Central student housing in Liverpool, by developers UNITE. Photograph: Owen Hatherley It's also a reminder that students were encouraged under New Labour to be an ideal combination of indentured serfs and aspirant yuppies. The actual conditions of students' existence in the 2000s, from the poverty of their housing, to their catastrophic debt, to their part-time jobs in call centres, to their years of unpaid intern labour, were bleak indeed; but all was hidden by an oxymoronic language of inclusivity and privilege - they might have been living in cupboards, but they were cupboards with plasma screen TVs; they might have felt underpaid, overworked and tithed, but were also constantly reminded of how lucky they were to enjoy the hedonistic student lifestyle. Suddenly, under the Conservative-Liberal Democrat coalition, one half of that bargain - the expansion of education that accompanied its part-privatisation - has disappeared, and we're now witnessing the fallout. So it's worth keeping New Labour's student architecture - desperately private, paranoid, gated, restricted, securitised - in mind when you think of the occupations of universities that have been such an important part of the student protests. Implicitly or explicitly, thisis the kind of space they are reacting against. It is a protest against the coalition, to be sure, but it's also a magnificent rejection of the fear, quietism and atomisation that was the result of earlier policies. The students' use of space is equally fearless. The interesting thing about Middlesex University is how totally suburban it is - a series of disconnected outposts in several outer north London boroughs, and the various protests at Middlesex suggested what could, and possibly couldn't, be done to politicise these places, which are so far from the metropolitan idea of protest as something which happens in highly symbolic central locations (the London sites of recent governmental cuts protests have been Parliament Square, Whitehall and Millbank). Middlesex has multiple campuses in suburban north London,with an effect of maximum decentralisation. The first occupation took place at Trent Park, the campus where the philosophy department is based, in one of those places where the 'green belt' instituted around London in the '30s is not entirely fictional. For over a week, Trent Park became a 'transversal space', i.e a Free University, with speakers and actions taking place inside the usual university spaces. One point about Middlesex, which made the protests there so unlike occupations at the School of Oriental and Asian Studies (SOAS) or the London School of Economics (LSE), is that the institution is already the model of the neoliberal university - dispersed, atomised, with no particular traditions of Glorious Rebellion. If, as Mark Fisher argued in his book Capitalist Realism (2009), the 2006 youth protests in France - in which students demonstrated against a bill that would have allowed employers to fire people under the age of twenty-six more easily - were easily presented as conservative attempts on the part of the students to retain privileges, then Middlesex, and the protests of winter 2010, are the opposite - rather, they are what happens when an already neoliberalised student body tries to politicise itself. If, as Middlesex Occupation banners insisted, this particular university is a factory, then like the factory it has learnt one of the principal lessons of the twentieth century - if you want to avoid conflict, decentralise, be far away from the (imagined) centres of power, disappear from public view, and make the question of who actually holds power as opaque as possible. Banner at SOAS, London during the December 2010 occupation. Photograph: Owen Hatherley The tactics of surprise and spectacle used at Middlesex have clear correspondence with those used by recent occupiers, albeit here on a much larger scale. At the first major occupation, at SOAS in November 2010, it was especially interesting to see the movement dealing with such a central location, right next to Russell Square, where it was much easier to reach a public of some sort than it had been in Trent Park. The place, which is as of now still under occupation,has had the feel of an activist enclave for a while now, and a large banner reading 'THIS HAS JUST BEGUN' currently flies in front of the college. Somewhat larger, and for that and other reasons the focus of much of the media coverage of the events, was the occupation of University College London (UCL), at the other end of Bloomsbury. As fans of Michel Foucault would appreciate, students picked the capacious Jeremy Bentham Room for their base of operations ('Jeremy Says No!' read one poster, depicting the eighteenth-century thinker; adjacent was another poster reading, inscrutably, 'Jeremy Also Says Panopticon'). The Slade School of Art, just opposite, soon followed UCL into occupation - as, indeed, did countless other universities up and down the country, and both SOAS and UCL had a board listing those which had followed suit. The spatial politics of the occupations themselves are obviously worth consideration. From what I could see at UCL in December, the ten days of hundreds of people sleeping together in one very large room had brought acertain intensity to the proceedings, and had shown how much the protests are becoming not just a critique of the singularly grotesque millionaires' austerity government, but also an attempt to imagine a new kind of everyday life. When I spoke here about student housing and the atrociousness thereof, more than one of the assembled students said something along the lines of 'Yes, we know that's awful, you don't need to tell us - but we're here creating something different, something positive, by ourselves'. That would be of little interest, though, if it were just confined to what is undeniably a fairly elite university. The UCL occupation was extremely adept at the use of both the media and space itself to publicise their cause. Not only were they quite astonishingly media-savvy - one corner of the room, a round table dotted with laptops, bore the title 'RESPONSE', and was constantly sending out communiqués on Twitter and elsewhere - but they were also keen to use the space around to draw attention to their demands and those of the student movement in general. This was the rationale behind their involvement in pickets of Vodafone (who allegedly recently evaded £6 billion in tax) and of Topshop (whose boss Philip Green is also allegedly both a prolific tax avoider and a Conservative-Liberal coalition adviser, which makes a nonsense of the coalition's already outrageous slogan 'we're all in this together'). It was also the rationale behind one of the protest's more inspired actions, a temporary occupation of the nearby Euston Station, a politicisation of the seemingly advertising-bound technique of the 'flashmob'. As well as using the space to argue their case to the assembled commuters, UCL students also produced a parodic Evening Substandard newspaper, in a prescient recognition of the media's hostility to them. The now-utopian (but once mundanely social democratic) promise of its headline, 'New Era of Welfare for All', showed the students' contempt for the prevailing rhetoric of guilty masochism presenting itself as austerity. 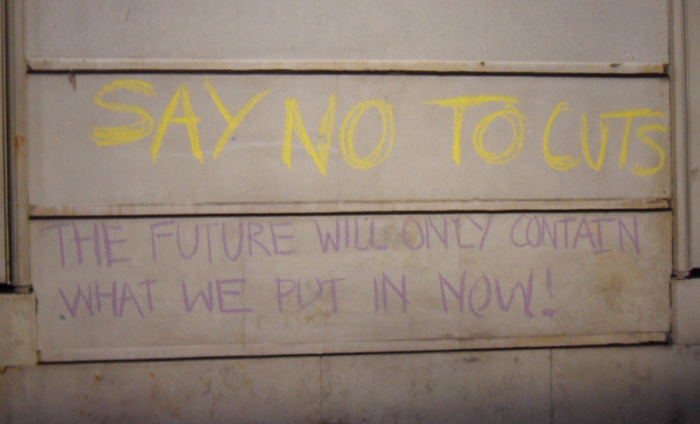 Throughout the last few weeks, the student movement have tried to avoid the tedium and predictability that marred the last decade of protest in the UK - whether the polite, and for all its numbers easily ignored, 'Stop the War' protests in 2003, or the various sparsely attended 'Carnivals against Capitalism', which were usually easily kettled and symbolically brutalised by the police. Kettling, a method first used in the UK on a large scale at the 2001 anti-capitalist protests in Oxford Street, entails penning a large group of people to, in theory, 'prevent a breach of the peace' - but as the coming-to-the-boil metaphor implies, the effect is invariably the opposite, leading to panic, tension and violence. Currently it seems to the automatic response to any large scale protest on the streets of London. In response, students have developed strategies to avoid police kettles, leading, in one instance, to a chase through the streets of London on 'Day X 2', and frequently to refusals to follow the prescribed march into pre-prepared kettles. The riot police's approach to this unpredictability has been harsh indeed - already over 100 complaints have been presented to the Independent Police Complaints Council. Some speculate that Police tactics were a form of revenge against the students' confident, unexpected use of the streets - specifically, revenge against the embarrassment of the police as they failed to stop the sacking of the Conservative headquarters at the first large student protest at Millbank, on 10th November. Nonetheless, a spectacularly servile media preferred to cover the mild harassment of two royals, as opposed to, say, the police's near-fatal attack on the student Alfie Meadows, or the dragging of a 20-year old with cerebral palsy, Jody McIntyre, out of his wheelchair and across the pavement. Yet throughout, this enormously unpredictable movement has shown that it will use the city as it likes. There's no better riposte to the grim, circumscribed, privatised urbanism of the last thirty years than that. This is invariably a matter of developers, not Universities, although Universities have often sold the land.